Chateau Ste Michelle: Chateau Ste Michelle Stimson Estate Cellars Cabernet Sauvignon his sparkling ruby red Cabernet Sauvignon has a strong fruit bouquet with juicy cherry flavors in addition to hints of black olives and spices. 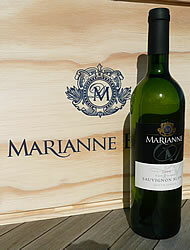 The taste is very soft and very harmoniously balanced with lots of juicy cherry fruit and subtle toasty aromas. The small addition of Merlot gives the Chateau Ste Michelle Stimson Estate Cellars Cabernet Sauvignon more complexity and a gentle fullness. https://www.weinbaule.de/red-wine-usa-chateau-ste-michelle-stimson-estate-cellars-cabernet-sauvignon-p-1168.html?osCsid=00eede352101eb0c94dd12a2d9ea9120"> Wine 7.98 4019409200855 WeinBaule.de | The Home of Wine Chateau Ste Michelle New In stock!